The 2011 NFL Draft has ended, and it’s time to determine whether the Arizona Cardinals helped themselves, or shot themselves in the foot. Of course, the outcome of this year’s draft may take several years to determine it’s true success or failure, but let’s take a look at it for what it is now. This year marked a significant change in how the Cardinals selected their draft picks. In the past, they had always selected based on position and the need of the team, but this year they decided to go with the best athlete or talented player available with their selections. To me, that is a risky proposition, yet the Cardinals front office claim that they have a plan. Before the 2011 NFL Draft, this is what we knew about the Cardinals. Their number one need is a starting quarterback. They have three starters on the offensive line that are not under contract. Their priority on defense was to upgrade their pass rush. They need a tight end that can run and catch, and they need at least one linebacker since they will be playing a 3-4 defense under new Defensive Coordinator Ray Horton. I believe that the Cardinals were looking to pick linebacker Von Miller out of Texas A&M with their first choice in the draft, but he was selected second overall by the Denver Broncos, so they went with their next choice, Patrick Peterson. 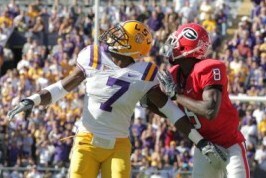 Peterson is a big cornerback at 6’0″ tall and 219 lb. With his size, he also has excellent speed, running the 40 in 4.34 seconds, which was second fastest by all defensive backs in this year’s draft. He has the ability and athleticism to be a playmaker, but at the same time, his risk-taking could cause him to get beat at times. The Cardinals feel his talents combined with Dominique Rodgers-Cromartie will give them one of the most athletic tandems in the game at cornerback, and allow them the flexibility to blitz more aggressively. 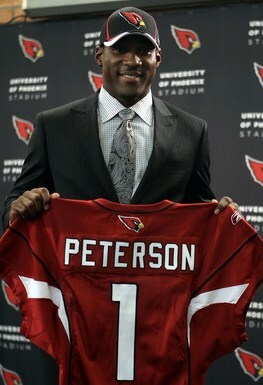 He is one of the top athletes in all of the draft, and overall, I don’t think it was a bad choice by the Cardinals. The only concern that I have is that there is a greater need at other positions on the team. In only his second season, Greg Toler had an excellent year starting at corner opposite DRC (Dominique Rodgers-Cromartie). He had the second most tackles on the team (90 in 13 starts), one sack, two forced fumbles, eleven passes defended, two interceptions, and one touchdown. Toler was tied for second in the NFL for all cornerbacks with 82 solo tackles last year. He is also big for a corner at 6’0″ tall and 192 lbs, and is not afraid to come up and stuff the run. DRC, starting corner on the opposite side of the field, is 6’2″ but only 182 lb, and is not a very physical player. He does not come up and help stop the run. As a matter of fact, he only had 44 tackles in 16 games and 0 sacks last year, but is a much better cover guy. I didn’t see a real need to go out and get another cornerback to replace Toler, and would much rather have seen the Cardinals go after a defensive lineman, linebacker, or offensive lineman with their first pick. In the first round of the 2011 NFL Draft, there were 6 Defensive Ends selected, 8 offensive linemen, and 6 defensive tackles selected. If the Arizona Cardinals were looking for a game changing pass rusher, there were plenty still on the board by the 6th pick in the draft. The Cardinals could have selected Alden Smith, JJ Watt, Robert Quinn, or Ryan Kerrigan. They were all selected after the Cardinals pick, but all went by the 16th overall pick in the first round. What does that say about the Cardinals, when 12 teams took a defensive lineman in the first round, 8 teams took an offensive lineman in the first round, and the Cardinals were 1 of 3 teams that took a cornerback in the first round. This draft choice was a real mystery to me. 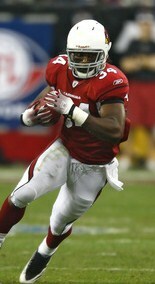 The Arizona Cardinals had recently drafted Chris “Beanie” Wells in the first round of the 2009 NFL Draft, and also have Tim Hightower only entering his fourth season, as well as LaRod Stephens-Howling entering only his third season. Ryan Williams was selected as the 6th pick in round 2 of the draft by the Cardinals. The running back pool in this year’s draft was pretty weak to begin with, so to pick Williams 38th overall, I felt was a real stretch. He has a smaller frame at 5’9″ and 212 lb, and is not fast, running the 40 in 4.61. He did perform well in the 60 yard shuttle drill, showing good lateral mobility, and has been known to be a good one-cut and go runner. He possesses good vision, runs low and hard, and was the highest rated athlete at that position left in the draft, and that is why the Cardinals selected him. Beanie Wells had an outstanding season as a rookie, leading Arizona with 793 rushing yards while averaging 4.5 yards per carry. Although he has been plagued with injuries, I feel that it is a little early to give up on him. At 6’2″ and 229 lb, he is by far the biggest running back and possibly the fastest running back the Cardinals have, and should be a big asset on third and short. He also should be able to pound out first downs in order to run time off the clock when the Cardinals have the lead. Tim Hightower took over the starting role last year, and has continued to improve each and every season. For a much smaller back, he also runs hard between the tackles. He rushed for a team high 736 yards last season, averaging 4.8 yards per carry. He is also a great receiving back, collecting 63 receptions out of the backfield in 2009. I don’t know what more you could want out of your running back tandem, and that is why I was surprised to see the Cardinals select a running back with their second round pick. The only reason the Cardinals do not have 1,000 yard rushers is because they don’t run enough (Hightower averaged less than 10 carries per game in 2010), and that is due to the lack of a good offensive line. It is also due to the fact that the Cardinals are usually trailing in games and need to pass in order to save time on the clock and score quicker. Again, I would have liked to see the Cardinals pick a defensive lineman or offensive lineman where the need is much greater. In round two of the 2011 NFL Draft, the Cardinals still had a good opportunity to select an offensive lineman that could help with their non-existent running game. Still remaining after their sixth pick in the second round, were Rodney Hudson, Orlando Franklin, and prospect Ben Ijalana. Again, why did the Cardinals feel the need to select only the second running back in the 2011 NFL Draft in the second round when they have severe deficiencies in their offensive line. The Cardinals have not had a true receiving tight end in years, so I guess I can’t say that I am surprised with this pick. They did not go with the best available athlete at this position, but instead they went will all out speed. 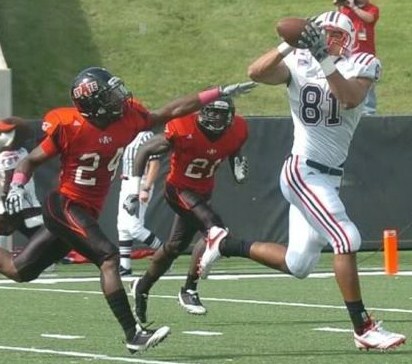 Housler was the fastest tight end in the draft running the 40 in 4.55 seconds. He was also ranked very high in many of the other combine stats. Along with the speed to separate from linebackers, Housler has athleticism and good hands. He also has a good vertical, is fearless coming across the middle, and can make those difficult catches in traffic. He will need to add strength and bulk, and be willing to block defensive linemen and linebackers if he wants to become an every down player. The Cardinals have not been known to utilize the tight end position as a receiver, but perhaps Housler will change that strategy. Ben Patrick led Arizona tight ends with 15 receptions for 123 yards last year, which was 47th in the NFL. In comparison, Jason Witten of the Dallas Cowboys had 94 receptions for 1,002 yards as a tight end. I have always felt that a good tight end can really be a game changer as a possession receiver, as well as a go-to guy in one-on-one coverage with linebackers. Along with Patrick, the Cardinals also have starting tight end Stephen Spach and last years rookie drafted in the 7th round Jim Dray. Perhaps one of these will become the blocking tight end, but it’s for sure there will not be room for four tight ends on the Cardinals roster. Again, not a bad draft choice, but perhaps could have been selected in the later rounds. I feel that the Cardinals did okay with this pick, but I would have selected linemen with my first two selections. The Cardinals have promised that once the lockout is resolved, they will be very active in signing and trading players. Their number one priority had better be at the quarterback position. I am glad that they did not try and find a starting quarterback in this year’s draft, but I sure hope they find a quality starter through free agency or by way of trade. My first choice would be Kyle Orton of the Denver Broncos. If that doesn’t pan out, I would go after Carson Palmer of the Cincinnatti Bengals, and as a last resort, I would go after Alex Smith of the San Francisco 49ers. I will speak more on how I feel about the Cardinals quarterback situation in a different post, as well as more on the rest of the 2011 Arizona Cardinals NFL Draft in a later post. ~ by Troy Erickson Realtor on May 3, 2011.